Wood paling is there to create rustic room design. With this natural material, you will see how incredible your room decoration is. White and black room color pursues monochrome sensation that looks attractive and cozy. Bedroom with wood paneling gives you more aesthetic value. Even, you are free to use wood as bed frame as well. Here, no need to paint them at all. Wood already has its natural color that will make any room become more astounding. Rather than applying wood panel anywhere, this room is designed with wood panel at unexpected place just like nook. Though not too large, but this space perfectly stands alone to become the focal interest of your home decoration later on, if you copy this design. Rather than using vertical wood panel, this room appears with horizontal wood panel that perfectly defines the space. Even, make the room look larger than its actual size. Furthermore, this idea take the room to a modern design. This room perfectly shows us how a wood panel room will look so awesome. Solid light oak wood with rustic oak wood shelf are together in one aim to make this room more adorable. Then, rustic rectangular wooden storage coffee table makes it more stunning. White brick wall is the best partner for wood panel at this room decoration. See, how it helps wood paneling wall look attractive. With suitable lighting, whether sunlight and or lamps, the room dramatically appears sophisticated. Wooden wall is not only for a rustic or traditional house style anymore. 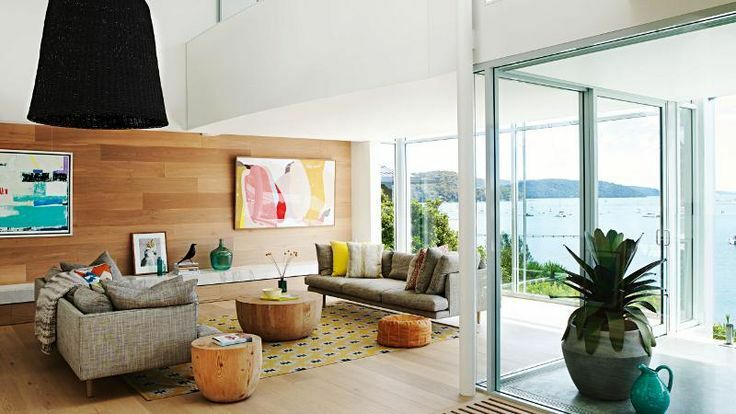 Take a look at this room with walls of wood that look modern and chic. Furthermore, the ceiling created in curve consists of some woods as well. This bohemian room style also use wood panel for the walls. Moreover, the untreated wood look unique arranged horizontally. The floor also use wood panel that works well with bohemian rug pattern with black and white color.